Microscope or Telescope? Which are You? Are you glad the presidential party debates are finally over? Oh yeah! Me, too. Now it is finally down to two presumptive candidates. 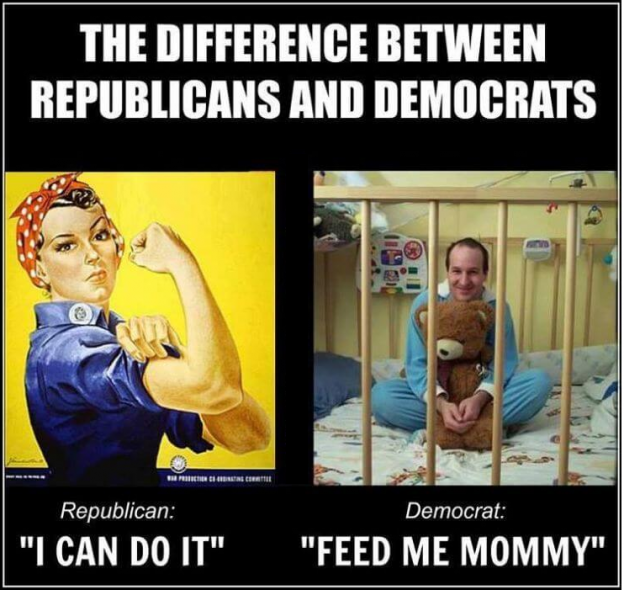 Hillary Clinton for the Democrats and Donald J. Trump for the Republicans. Now the candidates can at least begin sniping at each other. The one thing that I noticed is the prevalent concerns of each party. The Democrats were debating about totally different subjects than the Republicans. So as I am watching this, I notice that there is a clear pattern for each parties concerns. The Democrats were mostly concerned about personal issues. Their biggest concerns were about the taking or granting of individual rights; or dispensing federal monies to people in a not very discreet manner to garner votes. Because they focused on mostly individual issues, I associate them with microscopes. Bernie Sanders could not say enough about free college tuition for every person that wants it. How was the wise Bernie going to pay for this very costly perk? Well, he was going to tax the hell out of those mean, successful, profiteering corporations. You know who these corporations are. They are the people that provide jobs, buy raw materials, build facilities and purchase equipment to keep our economy running. Out of the other side of his mouth, he wants to punish any corporation that moves manufacturing facilities or corporate headquarters out of the US. Well, I have gone into this at length in previous blogs, but here is the abridged version. The corporate taxes in the United States are the highest in the world at a whooping 40%. The average corporate taxes in the world are 22%, with Ireland having a corporate tax rate of 18%. Thus, Ireland has turned itself from bust to boom in ten years by attracting corporations to move to their country, many from the US. But…just so you totally understand the corporate tax problem in the US we need to go a bit further. That 40% is the federal corporate tax rate. Then you need to add the state corporate tax rates with some states having a corporate tax rate of an additional 10%. Are you beginning to understand why American companies are moving their facilities to foreign countries? Much of it has to do with the US corporate tax rate and the fact that they need to be able to compete on the stage of the global economy. If the US company is paying combined taxes of 50%, and the Irish company is paying 18%, who will grow and prosper in the long run? Bernie has microscopic vision on this subject, all in the hopes of garnering young voters at the expense of the federal government. Do you understand the new federally mandated bathroom laws? I am so confused I am beginning to question my own sexuality. Have I been missing something during my existence as a heterosexual male? But the POTUS is touting this as a major step forward. So, here we are again, with the federal government tampering with how individuals should live. I am rather perplexed that there is not enough going on in this world and in this country that the POTUS has to take a microscopic view of bathroom habits. The microscopes, oops, I mean Democrats, are outdoing themselves on this issue. The most recent event at the Pulse nightclub in Orlando is a tragedy by any measure. If you were to believe the Democrats and the biased liberal media , this assault rifle walked into the nightclub with his date, a Glock pistol. Then these two weapons arbitrarily began killing 50 people. Isn’t that about the way this whole, gruesome event has been portrayed? Let me take another cut at this event. Unfortunately, another American grown radical Islamic terrorist has committed another act of violence. Did I say radical Islamic terrorist? Holy crap! I have just used words that have not been spoken by the POTUS, EVER! And, you can further connect this event with the San Bernadino shooting and the Fort Hood shooting. Guns were the weapon of choice, but the killers were all radical Islamic terrorists. (Bombs were the weapon of choice in Boston.) So the Democrat response? A sit-in at the House of Representatives. How childish. Let me make this perfectly clear. It is not gun control people, it is people control. But let us bury our head in the sand and maybe it will all go away. I wish it were that easy. If Clinton, Obama and Sanders are so against guns, then maybe the Secret Service personnel protecting them should set an example and give up their weapons. Do you think they would allow that? I am all for stringent background checks. But regardless of the procedure, the murderers in the three incidences mentioned above did not have difficulty procuring weapons. The Democrats are not for any type of border containment, thus allowing the free movement of illegal immigrants into the country. Additionally, all in the name of reminding us that this country is a melting pot, unlimited access to peoples from Islamic countries without background checks. Would you be surprised to learn that many illegal immigrants are voting and swaying the outcomes of our elections? That is because the Democrats have led the charge for not having government issued photo ID’s in most states. But…we will grant these illegal immigrants or immigrants from Islamic countries full benefits as if they are citizens. All of this at federal government expense. All of this to garner votes. So now we discuss the telescopes. A telescope is a far-reaching piece of equipment, with a much wider field of vision. I associate the Republican party with a telescope. Trump and many other Republicans have certainly discussed the national debt, which is now four times larger than it was at the end of the Bush administration. Have the microscopes made any mention of that debt? Have they offered any suggestions about reducing or curtailing it? I have not heard a word. Trump is a business man, and he knows that nothing, and I mean NOTHING, will survive in its present form if that debt is not addressed. We will create a world recession that will make the Great Depression look like a migraine headache. This country cannot afford to continually prop up those that do not wish to work or contribute to the well-being of this country. Welfare and social security cannot continue in its present form. The present administration has decimated our military. Not only has it reduced the size, but the POTUS conveniently dispatched any generals and admirals that disagreed with his policies. That would be over 400 experienced people over the term of this president. The Republicans want to rebuild the military. Whether this country wants to face it or not, we have enemies. There are no shortage of countries that would like to see this country, our financial systems, and our dollar all brought to its knees. The Republicans understand this, the Democrats want to avoid the issue and continue to spend. Remember all those corporations discussed earlier and the federal tax rate? Well, the Republicans want to cut that rate to stop the out flux of jobs from this country. There is no Democrat in favor of this. But here again, corporate taxes account for less that 20% of the monies received by the federal government. The balance is from the American worker. So, if we create more jobs, we will have less welfare and more federal tax revenue. Sounds easy. So why hasn’t it been done? It has been. By JFK and Ronald Reagan most notably. Here it finally is. The political hot button for the upcoming election. We have all heard about Trump’s proposal to ‘build the wall.’ Whether it gets built or not, I do know this….the security on our borders needs to be vastly improved. Not only are illegal Hispanics crossing our southern border, but so are some of these radical Islamic terrorists. They are hiring the Mexicans to show them how to cross our border to enter this country! I totally agree with Trump on his wanting to do background checks on people coming from Islamic countries. I think we should do background checks on people wanting to come from any country. Have you gotten the gist of this blog? I hope so or I have failed in my intent. It appears to me that the Democrats are focusing on individual items in the pursuit of more votes and to perpetuate the status quo. The Republicans appear to focus on national and world issues. We may not like what they are focusing on, but for the betterment of the country, we better start paying more attention. Our society has become very self-centered and government dependent. We will support anything that does not affect us. You can screw over my neighbor, just as long as you leave me alone. That attitude will be the demise of this once great nation. This entry was posted in Political Opinion on June 28, 2016 by Grandpa T.
Cancer. The Scariest Word in the English Language. Grandma P and I have led a very blessed life. We have traveled. We have wonderful sons and daughters-in-law. We are fortunate to have fine grandchildren. All in all, everything is hunky-dory in our world. The furthest thing from my mind during all of my years was cancer. 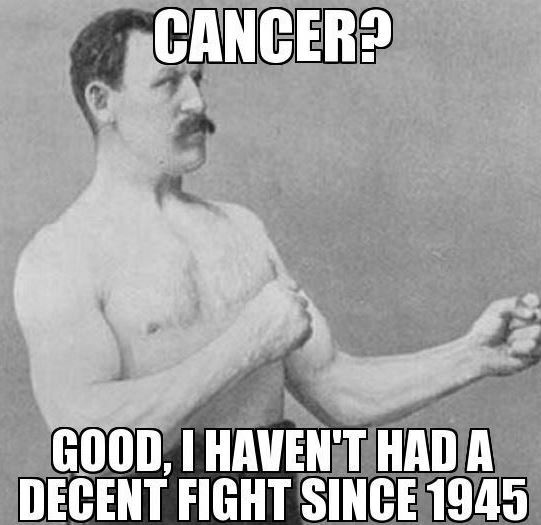 Neither side of my family had a history of having cancer. Grandma P’s family was healthy except for her mother, who died at the age of 52 of ovarian cancer. That occurred at a time when detection was not what it is today, and she was too far advanced for anyone or any miracle to have saved her. Oddly enough, Grandma P, during her medical administration career, supervised a large hospital cancer center. She was also the president of the American Cancer Society for our home state for a one year term. We were involved in fund raising events for the American Cancer Society. But me…I was blissfully ignorant of cancer as I was not concerned about ever, ever having to face the prospect of dealing with it. Then came 2014. Grandma P had a lump in one of her breasts. After having a biopsy, it was determined to be cancerous. So, after a lumpectomy and seven weeks of radiation treatments five days a week, she was cured. She walked away from this event with her positive and spunky attitude. Her attitude almost had the tenure of being ‘no big deal.’ I could not have been more proud of the way she handled the entire situation. Phew! Our first really big health hiccup during all of our time being together. Then came 2016. Early in the year as I was sitting in my office, probably writing another titillating blog, Grandma P walked in. I said to her, “Put your fingers under my right jaw. What do you think that lump is?” She felt the lump that I was talking about, about the size of a small egg and said, “I think we better have our doctor look at this.” So, on Ground Hog Day as Punxsutawney Phil was jacking around the citizenry of Pennsylvania as to whether we were going to get six more weeks of winter or not, I was on my way to the doctor. Thus began my journey and my first hand experience with cancer. Our general practitioner referred us to an Ear, Nose and Throat specialist at one of our local hospitals. After reviewing a CT scan, he referred me to another ENT doctor at a different health care provider, as he decided this was beyond his abilities. So now we met with that ENT doc, who told us it looked like I had four cancerous lymph nodes and may very well need surgery. Then he added, “five years ago, we would have done this surgery here, but now we don’t.” Say what? I now have gone through three different health care providing agencies, and don’t have one of them that want to do my treatments. I am beginning to think this is serious. He went on to say, ” I recommend going to Birmingham, Alabama; Houston, Texas; or there is a new hot-shot ENT doc in Pensacola, Florida. His inference was I would need some very delicate surgery, mostly because the size of the lump under my chin. Holy Crap! So both Grandma P and I both did our ‘due diligence’ on the hot-shot doctor in Pensacola. After doing this, and because it is the closest to our home, we decided that we would see Dr. Hillary White at Baptist Hospital in Pensacola. Now I need to back up a little. Even though we were going to see Dr. White at Baptist, we still intended to get any treatment we needed locally. We made an appointment with Dr. White. She had already reviewed all the documents and tests that were done from the other agencies before we got to her office. She inspected me, and we were scheduled for more tests, exploratory surgery, and a follow-on appointment. After the additional biopsy results, she informed us that she took my case before a ‘tumor board’ and it was determined that I not have surgery at this time, but would need seven weekly chemo treatments, and seven weeks (five days a week) of radiation treatments to reduce the size of the lymph nodes. Okay. Not good news by any stretch, but now we at least knew what was needed. We were feeling good about finally having a plan after chasing around for weeks seeing doctors that didn’t want to treat me and having a bunch of tests. We went home fully expecting to never see Dr. White again. Now Grandma P put her medical experiences into ‘warp drive’ and began calling oncologists and radiation oncologists about getting my treatment going. It turned out the oncologist was with one health care provider and the radiation oncologist was with another. One could see me in 10 days, the other in two weeks. As you can imagine, I am now thoroughly ensconced in the fact that I have cancer, and I wanted to get into treatment as soon as possible. One could even say that my ‘pucker factor’ concerning my situation was at an elevated level. My military and business experience told me that waiting longer was not going to make my situation better. I wanted action! We again went to Baptist hospital and had an appointment with Dr. Zheng Topp, our oncologist, and Dr. James Adams, our radiation oncologist. Both were professional and informative. AND (this is a very big AND), we were going to begin radiation treatments and chemotherapy treatments the following Monday! OMG! After being kicked around by various health care systems for over two months, I was going to begin treatment 5 days after meeting Dr. Adams and Dr. Topp. After renting a condominium for 7 weeks overlooking the Gulf of Mexico, we began treatments. (I decided if I was going to be miserable, I was at least going to have a view.) My first treatment was the radiation treatment. The three radiation technologists were Amy, Lisa and Kyla. Because of the way they had to truss me up like a Thanksgiving turkey during treatments, I referred to them as the ‘Princesses of Pain.’ In reality, they were very personable and extremely knowledgeable. Now that I am at home and recovering, I actually miss them. They were very much closer to being ‘Charlie’s Angels’ than the ‘Princesses of Pain.’ We also met Nurse Pat, Dr. Adam’s nurse assistant. After completion of radiation, we went one floor up to Chemotherapy. After meeting with Dr. Topp and her nurse assistant, Nurse Liz, we received our first chemotherapy. That was our schedule for seven weeks. On Mondays, I received chemotherapy and saw Dr. Topp and Nurse Liz. I received radiation every day of the week and met with Dr. Adams every Wednesday. I want to say one more thing about Nurse Liz and Nurse Pat. They are the two most dynamic and knowledgeable nurses I have ever met. There was nothing, and I mean NOTHING, that would get by either of these two ladies. They reminded me of two Sergeants Major that would know about everything going on around them. With a little practice, I think both of them could juggle running chainsaws. My reason for writing this? Cancer awareness, for one. But, if ever faced with a similar situation like mine, find yourself a health care provider that can do it all. The parts and pieces approach did not work for us. Baptist Hospital did my blood tests, CT scans, did my biopsy, inserted my port for chemotherapy, and installed my feeding tube. All routine, all timely, all in-house. As for me? Life certainly throws some curve balls. I have had my ups and downs. I did not realize that the effects of chemo/radiation continue and multiply after completion of the treatments. I have lost my sense of taste. My throat was sore for a long time after completion. I couldn’t talk because of my sore throat. I have lost over 45 pounds. As I am writing this, I cannot eat solid foods. But things are getting better. Grandma P will not allow me to sulk. And I need to heal as we have more travel to do and grandchildren to visit. In retrospect, we know we made the right choice by receiving treatment at Baptist Hospital. This entry was posted in Common Sense, Political Opinion and tagged Baptist Hospital, Cancer, cancer treatment on June 19, 2016 by Grandpa T.